The following guide will show you how to join multiple video files in one file, please follow the steps below to complete the video joining. 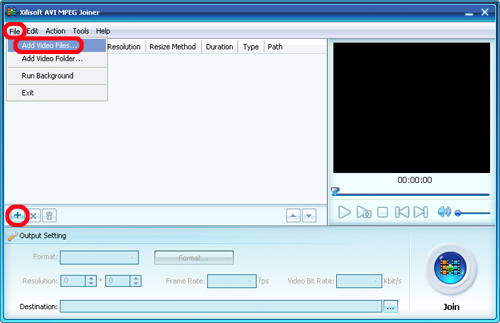 Download, install and run Xilisoft AVI MPEG Joiner. Click "Add Video Files" button below the file list or click "File > Add Video Files..." in the menu to add video files you want to join into the file list. Or click "File > Add Video Folder" in the menu to choose a folder and add all video files in the folder into the file list. 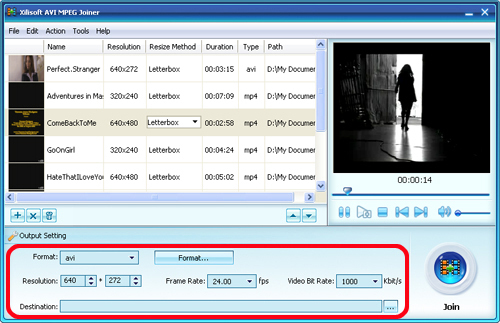 Choose a target format from the "Format" drop-down list, click the "Resolution" up and down arrow to set proper resolution, and choose a frame rate from the "Frame Rate" drop-down list, and choose the video bit rate you want from the "Video Bit Rate" drop-down list., then click "Select Destination File Location" button to choose a path for saving destination file. 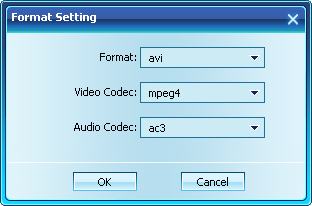 Tip: If you want to set the video codec and audio codec for the output format, then click "Format..." button beside the "Format" drop-down list to open "Format Setting" dialog box as following, and choose the format, video codec and audio codec you want. After all the preparation completed, click "Join" button at the right bottom to start joining these video files. When the joining is in progress, you can click "Run background" button to let the program run in the background for lowering the running priority. After joining is completed, click "Open Destination Folder" to check the joined video file.